Made of high-quality PU leather and stainless steel buckle that can easily withstand tears and sweat. These travel tags have been designed to make traveling easier by allowing you to quickly identify your luggage at airport terminals. The steel buckle allows you to easily fasten the tags around any handle. Each luggage tag has a name card to write your name, telephone and address for easy to identify your luggage from others. It's a great gift for people who like travelling. Package include: 2 Pack Luggage Tags. Size:4.9 x 2.8 in (12.5 x 7 cm). High quality PU leather, soft and durable. In front with a protective film. waterproof. Removable durable PU strip, easy to attach and remove. PU belt connect your luggage and tag closely. 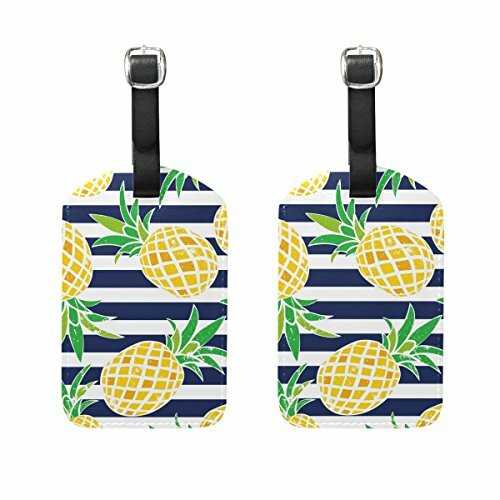 Personalized Luggage Tags with unique pattern on Both Sides of Your Tag, back side with information card, unique and useful. Luggage tags can be well connected with suitcases, backpacks, sports bags, briefcases, golf bags, strollers, and other packages. Besides, it comes with one belt with buckle connector for connecting your luggage with the tag.